Which one is the “right” one? In Europe, names of big cities aren’t just pronounced differently, they’re often spelled differently, and in some cases they’re completely different words. Paris (“pah-rhee” in French) is Parigi in Italian (“pah-ree-jee”). Venice (“ven-iss” to English speakers) is Venezia (“ven-et-see-ah”) in Italian, but Venedig (“veh-neh-dich”) in German. The German city Cologne (“koh-lohn” in English) is just the English pronunciation of the French (“cuh-luh-nyeh”), but in German, it’s Kölln (“kuhln”). This is the case with a lot of words. Even the word for the German language has FOUR completely different names just among the aforementioned languages: German (“jer-man”) in English, Deutsch (“doy-tsh”) in German, allemand (“ahll-mon”) in French, and for some bizarre reason, tedesco (“ted-es-ko”) in Italian. Why does it have so many totally different names? I’d like someone to explain THAT one to me. I know what you’re thinking. There is no “right” name for anything, is what you’re thinking. Words are just sounds, the meaning of which we agree on, right? Whatever is correct in the language you’re speaking is the “correct” way to say it. Nobody thinks you’re cool and cultured if you’re speaking English, but call Paris “Pah-ree” like the French, after all. But here’s where it gets wrinkly: most Frenchfolk, when speaking English, still call it “Pah-ree” and not “Pa-riss.” To them, after all, there’s only one “correct” way. I sympathize completely. When speaking a foreign language and a city (or a word) from your native language comes up, the temptation is very strong to pronounce it the way you’re used to pronouncing it, not the way they do in the language you’re speaking. For example, “McDonald’s”, as in, the restaurant chain. If it comes up in a French conversation, I think to myself, do I really want to pronounce it with a goofy French accent? Or do I want to temporarily drop my French just so I can say it the American way? Honestly, I have no answer. I still struggle with this. What about you? What native words do you refuse to say in the accent of the foreign language you’re speaking? 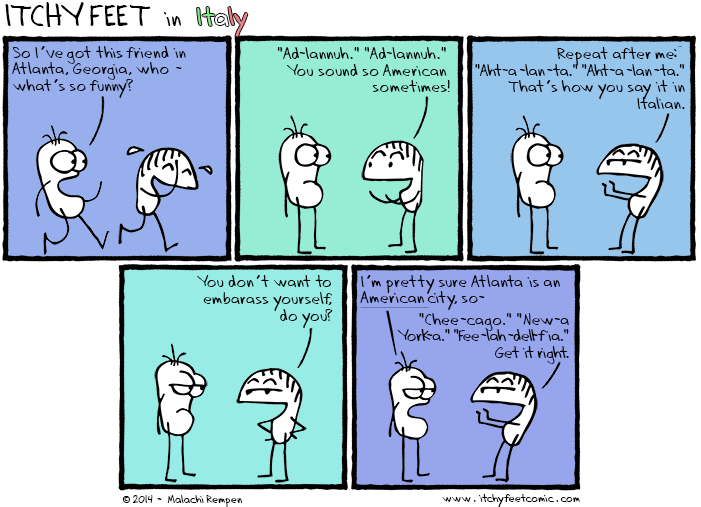 Which ones do you cringe when hearing foreigners say it? What’s the correct way to say “Los Angeles”? A topic after my own heart! When it comes to Americans the bottom line is that they are just too History and Language challenged, as well as simply too regionally divided. Far too often a person from a northeastern city, say Boston or New York, can barely understand someone from the deep south, say Mississippi or Alabama, and they are supposedly speaking the same language! My personal pet peeve is when people try to anglicize names, but aren’t even using English pronunciation. My last name is a perfect example: Lando, from Italian lahn-doh, both syllables equally stressed, “A” as in aaahh, final”O” as in OH. Usual anglicization would be more or less Land-Oh, as when a seaman sites land. Far too many people pronounce it Lan-dow. You touched on the historical issue but I would like to add how there are so many Spanish place names that get bastardized. In just state names alone there are Arizona, California, Colorado, Florida, Montana, Nevada, Texas. City names are far too numerous to list. But there is also a long list of French names, Detroit, DesMoines, and St. Louis just to name a few. Really, how do you get duh-moyn from day-mwan? And lu-iss is spelled Lewis. Louis is lu-ee. Thanks for listening to my kvetching. I am just of the belief that part of the way you show respect for someone is by taking the time to get his or her name right. I am still troubled by how such a big stink was made in the US in the matter of one Terry Schiavo. Everyone had an opinion but no one took the time to get the last name right: it’s skee-ah-voh, not shy-voh. @Michael Very true about the French influence! It’s not just localized in America, of course. The city of Strasbourg, on France’s border with Germany, flipped back and forth between being French and German, so do you say “Shtrahs-booerg” like the Germans, or “Stras-bour,” like the French? Both and neither, I guess. Is it perhaps misleading to talk about how to pronounce a name (etc.) ‘the way they do in the language you’re speaking’? Languages are surely too large a category in this instance. Clearly, most English speakers in the USA will pronounce ‘Atlanta’ rather differently from most English-speakers in, say, England, and there will be differences among Spanish-speakers from all over the world. Equally, the question can become one of colonialism: a speaker of English in a country where English is the dominant language by dint of military and/or political conquest might have perfectly good ideological reasons for not wanting to pronounce local place names ‘the way they do in [England/America]’. That speaker might not even want to use the same names as the hegemonic power does, even if those are the ones on the signposts and heard on the news. In the same way, the name for the people themselves can indicate quite clearly different neighbourly relationships. Compare the Polish name for ‘German’ (‘Niemiec’) basically meaning ‘one who cannot talk [our language]’ or the English word for the Welsh (basically meaning ‘foreigners’). Germans – having not been conquered by the Poles – will probably have fewer issues with the former word than many of the Welsh do with the latter. It’s not the *language* which controls the pronunciation – or the choice of word – in any speech act, but the context (dialectal, political, social, historical) in which that speech act takes place. From “Theodiscus”, the latinised form of the Germanic word “þiudisk”. If my mind doesn’t play tricks on me, it should mean something as “vernacular” or “referring to the people”. After the fall of the Roman Empire, when lots of Germanic tribes came into the Italian penisland, that word was used to address people who did not speak Latin but Germanic vernaculars. That’s were the German “deutsch”, the Dutch “Duits”, the Danish, Norwegian, and Swedish “tyska”, and, obviously, the Italian “tedesco” are from. I’m brazilian. Once I was went to Mc Donald’s with an american friend and she found extremely weird the way we pronuncie the restaurant’s name (meh-kee do’-now-jees). It sounds too different from the original pronunciation. Even tho she has been exposed tô many different langauges before, situations like this always sounded too weird for her. But anyway. When i speak english, i always say Rio (the city) like americans do, instead of “heeoo”, like brazilians do. But for other words, i stick with the brazilian pronunce, like caipirinha (a popular brazilian alcoholic drink). Kay-pee-ree-nya sounds too silly for my ears. Yeah, this one plagues me here in Ukraine, and I go back and forth. Sometimes I’ll drop the Russian for that particular word or name and go with the American pronunciation only to have them not understand me at all. Then of course there are the times when I’m *trying* to pronounce it with a Russian accent and they still don’t get it because I’m doing it the way I think it would sound, not the way they say it. @Brandon P I totally know what you mean about speaking low-level English on purpose. It’s a terrible habit, for both sides, but it’s hard to help! Once I learned the Italian pronunciation, I just can’t do the American “sh” in the middle. And people look at me funny. @Heather aww jeez. Sorry. I didn’t mean to interject that there. out of place!! @Brandon P Ha, often when I was tired of speaking correct Russian, or say, losing an argument I would speak low-level Russian and purposefully not understand my Russian girlfriend. I love the fact that I’m not the only one fascinated by German’s many names! The explanation I remember from when I looked it up is that since the area now considered “Germany” was originally inhabited by many different tribes, the other European peoples generally named the area (and its language) after whichever tribe they encountered first, which varied depending on where they came into the region. 1) German = comes from the “Germans” or “Germanic” tribes. The summarised word the Romans used for the people east of the rhine. 4) Tedesci = comes from the word theodiscus/theotisce, which means literally: “in the tongue of the people” or something similar. @Uli This…this is fascinating. Thank you! Do you know of any other names for Germany? @Malachi Rempen I know one. In Czech language we have word for them “Němci,” (derived from word “němí” – meaning: mutes or those who do not speak) the story, at least how it is taught in schools, is that slavic tribes didn’t understand their languages so they called them mutes. I’m Scottish, it’s always a kind of weird double standard on foreigners pronouncing Edinburgh correctly. Here, it’s pronounced like Ed-im-burra, sometimes even contracting to what sounds like Embra. In French it’s Édimbourg as in Strasbourg so it’s perfectly acceptable for them to pronounce it as such. Italians are also allowed their Edimburgo in peace. God help the American that calls it Edin-burg as in Pittsburgh though!! I understand your toughts so well! I try so much, and customers always correct me when I don’t say it the right way. Some people also looks like they can’t understand what I say and I feel so frustated. The different names for the German language derive from different tribes. Allemand and alemán from the allamannen, tedesco from the teutonen, German from the Latin name for the province germania. I’ll be the guy that always try to change to the audience. Born and raised in Antwerp, Belgium. Grew up with Dutch&French at home, while tv, computer sciencd and first internet plunged me into English. German is an official language in Belgium, so we get that pushed on in school. I’ll a self-educated portugese speaker (was in Brazil for a total of over 6 months, made a lot of friends and still speak it on viber or Skype). Side note: x-burger is incomprehensible for most non-speakers. My name is Philip and I pronounce my name differently in every language. I hate it when the French people say “Le Hobbit” (le-Ob’i, with the stress at the end and the aspirated h); and McDonald’s, they call it McDo (also with the stress at the end) Yes! Because they’re big fans of making up shortened forms of words 😛 It’s also very funny when they pronounce “Game of Thrones” and “Breaking Bad”. I don’t like neither how Spanish-speaking people translate almost everything from English. They call U2 (the band) “U dos” (ooh-dows). R2-D2, from Star Wars, is called Arturito (Spanish diminutive for the name Arturo) just because it sounds similar!!!! Spanish is my native language, but I am against all these unnecessary translations. Even though, I sometimes just try to be empathetic and say the names and words the way other people say it when they are talking to me in their language, that’s why if I am in France I say “Le Obí” (against my will, but I say it anyway) and U-dos in Spain, and so on. @Liss I remember many years ago in Spain being completely flummoxed on encountering “la Reina Isabel” when reading a magazine article. The only “Reina Isabel” I was aware of at that time was that of “Ferdinand and Isabella” fame in the time of Columbus. It was only when “Príncipe Felipe” and “Don Carlos” turned up in the same article that I suddenly got that Aha! feeling that all the Royals had been Spanified. @Alice haha …”the Royals had been Spanified”… epic! It is true! @Liss Hi Liss, well Columbus was Genoese (Genoa was a sea port and one of the great Renaissance cities in Italy at that time), so Colombo is his original name. The Portuguese kept that. The Spaniards and Portuguese have trouble distinguishing the sounds b, f and v, which is why they mangled the end of his first name. Columbus spent a lot of time in the port of Barcelona with its huge shipyards, where they speak Catalan, so that’s where the shortening to Colón came from. The French just lop of the ends of words anyway, so that’s where the last syllables went there. In English, the second “o” changed to a “u” possibly because of the difficulty in Germanic languages of pronouncing an “o” sound before an “mb” combination. The “us” at the end may come from the Latinized form used in the lingua franca of the day. His name in German is Christoph Kolumbus. Haha, I’m so glad so many people are thinking about this! I’ve wondered about it before too, ever since I realized that I seem to have some unconscious set of rules for when I do and do not pronounce these sorts of things the ‘right’ way. I have an idea that my unconscious rule is that it’s okay to pronounce a word in its native pronunciation as long as it’s allophonic with its English pronunciation? For instance, I would normally say ‘Rotterdam’ with a rolled uvular R at the beginning and an -ahm sound at the end, because the first is allophonic (rather than phonemically contrastive) with English rhotic R and the vowel isn’t insanely different between English ‘dam’ and the way I’m pronouncing it. But I usually would say ‘The Hague’ rather than ‘Den Haag’ in English, because unless you already know the name, it’s super different and potentially confusing (and pretentious?). @Jakob Gibbons By no means! We are curious and interesting and good-looking language learners. The number of times I correct people when they say sudoku has become rather tiring, but people don’t want to change how they say it because it doesn’t sound English. However I shall go on correcting them, and they’ll go on ignoring me. I think the right way to say “Paris” in English should be “Paeris”, just like it sounds with a “General American” accent. I live in Ukraine, and people here try to say my name with an “American” accent… and it drives me CRAZY! They say “DEHveed” because they’re not used to the vowel glide and there is no “short-i” sound; however, it’s even worse when they use the vowel glide… “DAYveed”… I want to cringe. I MUCH prefer the Ukrainian version of the name, “Davyd.” It’s simple, it’s natural… It sounds good on their tongues. If you’re speaking English with me, say “David.” If you’re speaking Ukrainian, say “Давид,” because that’s my name. When I lived in Germany I hated having to say London the German way, but people either didn’t understand if I said it the English way or I felt weird popping an English word into a German conversation. Re Cologne, you have combined the German and the local dialect way of saying it. The German way is Köln and the local (Kölsch) name, especially at carnival time, is Kölle. Kölsch is a very interesting dialect. Although it is being used by fewer people as time goes by, it comes alive at carnival time because in Cologne all the carnival songs are sung in Kölsch. Thanks for your blog. It was very interesting. I used to do telephone reservations for a German airline, speaking German, though I’m Irish so I’d get English speakers transferred to me. Two that stick out in my memory are an Italian who, speaking English, wanted a flight to Monaco…which is of course the Italian for Munich/München. Took a while for me to realise and not book Monaco the Principality! The other was an American who wanted to go to ‘Norlin’. Worked that one out as New Orleans but the man could not pronounce the word any differently and was very annoyed with me for not understanding! Here we would pronounce it New Orleens, two separate words. As a native Angeleno (Los Angeles) I am confronted with amazingly bastardized and/or odd Spanish and other names/phrases. Some of my favorites; “The La Brea Tarpits”, literal translation – The Tarpits, Tarpits. Or these; Los Altos Heights – The Heights Heights; Lake Tahoe – Lake Lake; El Camino – The Way Way; these two Calif. cities, Manteca – Lard and Los Baños – The Bathrooms. And Spanglish; snorgling; oakmeal; ¿Estás ready?– Are you ready? Just mi dos cents. I have the same problem when I talk Serbian. In Serbian you don’t have the – uhmmm how do you say “Umlaute” in English? – Umlaute, they call Köln “Keln” or Düsseldorf “Disseldorf”. And sorry, as a native German I really can’t say Disseldorf. This city will always be Düsseldorf for me.